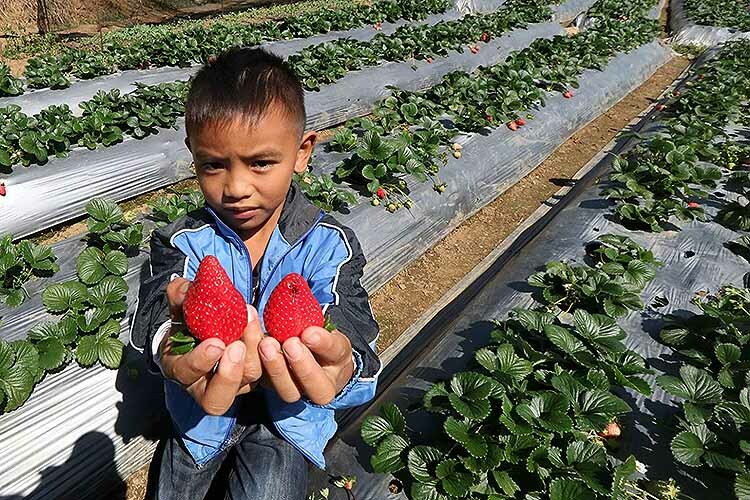 BAGUIO CITY – The Baguio City government is pushing to promote agro-tourism in the Philippines’ “summer capital” and is looking at launching the city’s first large-scale strawberry farm by summer. Councilor Leandro Yangot, who accompanied members of the Baguio media early this week to Barangay Santo Tomas Central, said residents here formed the Bilis Farmers Association and planted San Andreas and California strawberry varieties on a one-and-a-half-hectare lot in August last year. With the abundance of fresh spring water and adapting the organic system of production, the farmers are now reaping big and sweet berries. Yangot said the city government is considering converting the area into another tourism destination in Baguio, which is also known as the “city of pines” for its abundant pine trees. While Baguio is a highly urbanized city, a number of barangays in the outskirts are known to produce agricultural products. Yangot said it is for this that he authored Baguio’s Urban Gardening ordinance. The concept was made the theme of the contest to encourage city residents to plant both edible and ornamental products in their homes for household consumption and for additional income source if they produce extra. Yangot said the Bilis Strawberry Farm would not be opened to the public as an agro-tourism destination until the completion of an environmental plan that covers area protection, installation of comfort rooms, and allotment of parking slots. Yangot said the Baguio government does not want a repeat of the “La Presa” fate, where the colorful, sweet-smelling vegetable plantation higher up the Santo Tomas mountain in nearby Tuba town in Benguet turned bad after the place was popularized by a Philippine television series. Locals and tourists alike uncontrollably flocked the area, prompting residents to financial take advantage of the place’s popularity, but forcing the Department of Environment and Natural Resources in 2016 to close the spot to visitors and let the place heal as nature would. Yangot said the Baguio City government would not want to be caught off guard just like that.